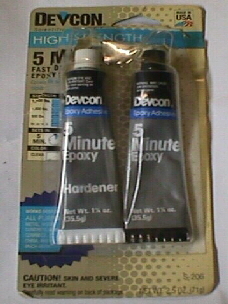 This is 5 minute epoxy. Great stuff to have handy. It holds on most surfaces, sets up fast, and is waterproof, as well as fuelproof. Here is a lumber crayon, and a grease pencil. Both are handy to have, great for highlighting timing marks, marking tires and other parts. Here is an exhaust manifold stud. I like to use fine thread brass nuts to hold the manifolds on. Stripped studs are a nightmare. I use new nuts if I remove them for any reason. 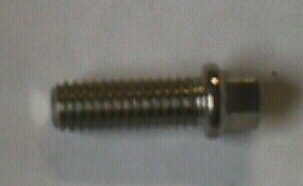 This is a header bolt. It is a 3/8"- 16 thread. Notice the 3/8" head. It has a shoulder around the base of the head, yet the head being small, is easier to tighten and loosen. This bolt happens to be stainless steel. An anti-sieze compound should be applied to it's threads to prevent spalling, and seizing which can be a problem with stainless fasteners. This is a 400 small block motor mount bolt. GM part # 460308. About 6" long. They come 2 to a package, with stop nuts. I had to replace one of mine, because a previous owner used a Grade 5 from Home Depot, or who knows where, with a regular nut. This GM bolt, is a Grade 8, with a Grade 8 stop nut. There is a huge difference in bolt shear strength between Grade 5, and Grade 8. There are few places GM used Grade 8 bolts, motor mounts are one of them. The other place is the steering system. Leaf springs, body mount bolts, body bolts, crossmember bolts, driveshaft bolts, all exterior engine bolts, are all Grade 5. NEVER USE A GRADE 2 BOLT ON A VEHICLE. Grade 2 bolts can be identified by no raised lines on their heads. Grade 5 bolts have 2 raised lines on their heads. Grade 8, pictured below, have 6 raised lines on their heads. 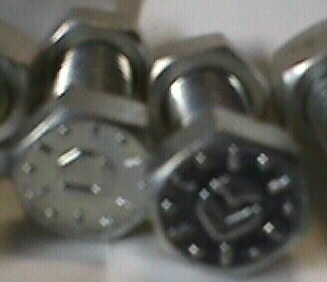 These Grade 8's pictured, are 1/2"-13x 1 1/2". I have 4 of them holding my rear bumper on. I learned the hard way, by shearing the Grade 5 bolts holding my rear bumper on, while trying to pull out a stuck truck. Luckily, I only sheared 2 of the bolts holding it on. I limped to a GM dealer, and bought the Grade 8's. These are what you want to hold the tow hooks on your truck, winches too.